Security and privacy are typically the main reasons for investing in a gate replacement or new gate installation, but aesthetics and the desire to maximize property value also play key roles in homeowners’ gate-purchasing decisions. 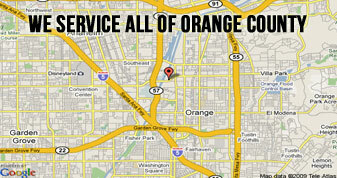 Whatever your motivation for wanting a gate, OC Garage Doors and Gates will provide residential or commercial gate installation with top-notch professional service throughout the Orange County area at affordable prices. WHAT gate type should I choose? WHAT customizations can I afford get in my budget range? WHAT gate size will my property allow? WHAT other gate features are available? WHAT must I do to maintain my new gate? WHAT impact will a gate installation have on my property value? While buying a new gate can seem simple at first, this can become an overwhelming task once you begin to explore all available options. There is a myriad of answers to the above questions, being able to figure out which ones best apply to your personal needs will make selecting your new gate a much easier process. 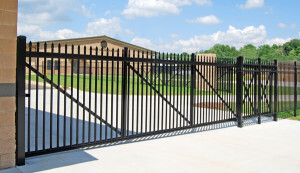 When deciding on a new gate installation, there are two main types of residential and commercial gates from which to choose: Slide gates and swing gates. How do you know which gate option is right for you? Even still, once you settle on the right type, should you go with an automatic or manual gate? Examining certain conditions, such as desired upkeep, budget range and space allowance – along specific needs can help you go far on your quest for the perfect gate. For cities like Costa Mesa with an economy that relies heavily on retail and other commercial services, a quality gate makes for an essential investment for the protection of goods. Let’s take a look and weigh the benefits of various gate types. Slide Gates- Slide gates are typically ideal for residential areas, as neighborhood area restrictions tend to lead homeowners looking for the most space-efficient option. Slide gates are great for this condition, as they require minimal space.However, slide gates do require a bit of maintenance to ensure they continue running smoothly. It is important to stay on top of keeping the gate track clean and free of any debris that could potentially derail the gate while trying to open. This can be achieved by simply inspecting the track on a regular basis and removing any obstacles before they become a problem. There is also the option to buy brushes that automatically sweep the track clean when opening the gate.Slide gates tend to be pricier than swing gates, as slide gates have parts that are more intricate than those of the swing variety are, and installation costs can be more expensive. 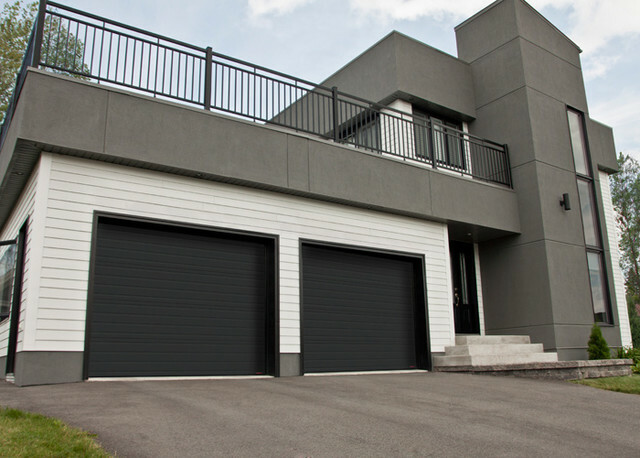 Keep in mind also that, for driveway gate installations, slide gate tracks require a level plane, so ideally the driveway area should be relatively flat. The flatter, the easier installation will be. Swing Gates- Swing gates are utilized more for businesses than residences for aesthetic purposes. For residential use, swing gates are more commonly seen more in apartment complexes as these types of gates demand a greater amount of space for opening.It is important to allow enough room if the gate opens toward a main road to give cars enough space to wait without blocking traffic. 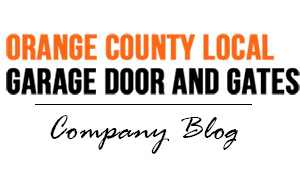 If you are looking to get a swing gate and room is an issue, look for two-door gates, which are a bit more space-efficient than single gates due to requiring a smaller opening radius.Swing gates are great when it comes to maintenance, as they are usually worry-free. 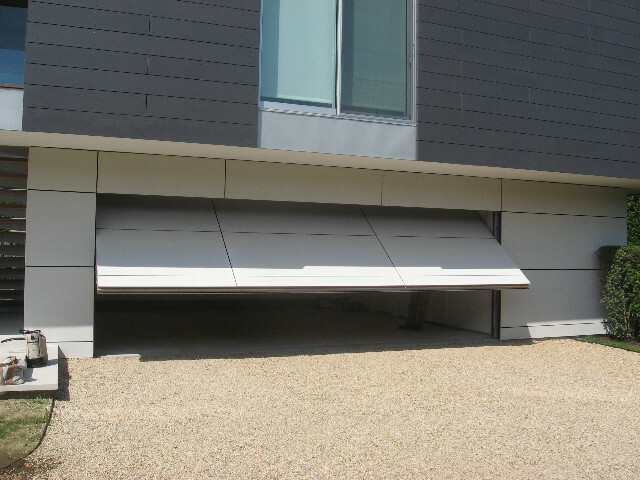 As stated before, they have fewer parts – usually just hinges – as opposed to wheels and tracks for slide gates, and this convenience makes for less potential of costly repairs down the road. Even less maintenance is required if it is a manual gate. Again, the purchase of a swing gate will save you money over a slide gate from installation and operation fees alone, although there is typically no difference in structural quality. Once you know your maintenance preference, budget and available space, you can now make an informed decision on what gate type is the perfect fit for your home or business needs. Gates come in a variety of materials to suit your specific taste. 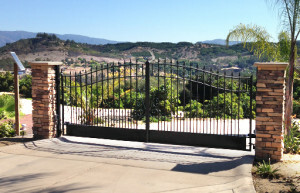 If you live in a city like Irvine, which has been recognized as one of America’s safest cities for many years, then continuing that tradition of security calls for the sturdiest, most reliable gate material available. 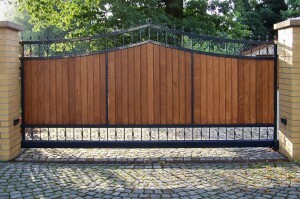 When selecting a gate material, for consistency, a good rule of thumb is to choose a material that matches your fence. 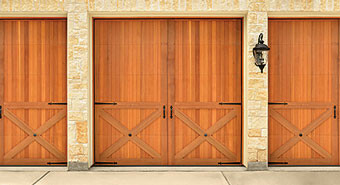 Available options include wrought iron, aluminum, and wood gates. Wrought Iron Gates- When it comes to strength, security and durability, nothing comes close to a wrought iron gate. You can find wrought iron gates in an array of design patterns to match your own personal style. 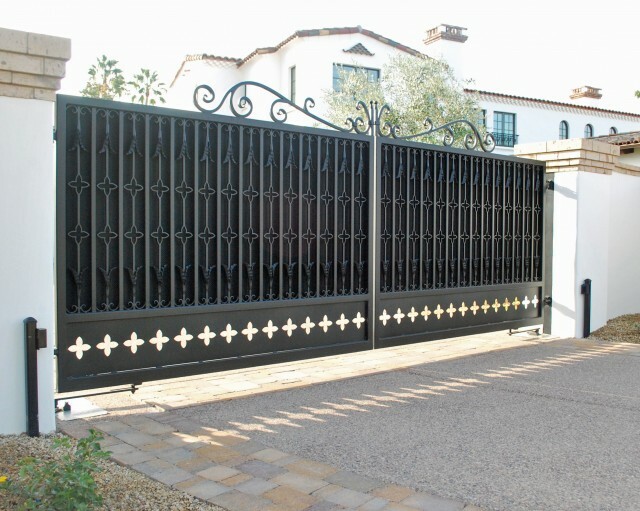 For long-lasting results, a wrought iron gate can be coated to prevent rusting.Because wrought iron gates are of the highest, most durable quality, they tend to be on the high end of the pricing spectrum. Wood Gates- For a more cost-effective, yet equally stylish gate material, consider wood as a viable option. Wood gates are available in style patterns that are just as impressive as those of wrought iron gates.However, wood gates are much more susceptible to the elements, and depending on where you live, this could add up to quite an amount of replacement and repair costs.Keep in mind that, whereas wrought iron and other metal gates are held together by welds, the much heavier wood gates require brackets and other fasteners to hold them together and thus will cause the structure to loosen and warp over time. Aluminum Gates- If you want the look of a wrought iron gate, but do not quite have the budget for it, aluminum makes for a great investment. 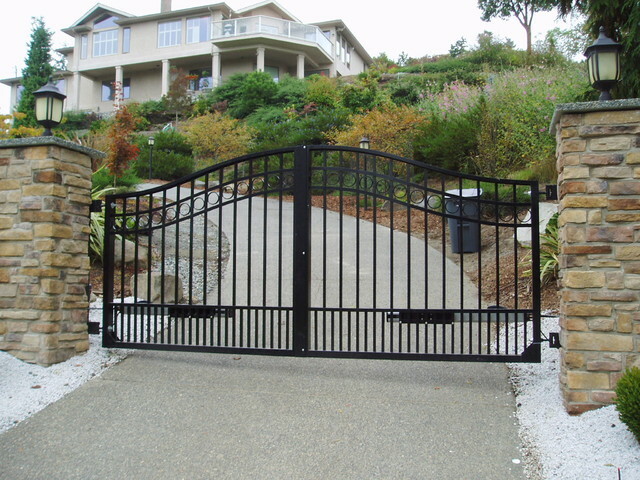 Aesthetics, however, are typically the only area in which aluminum and wrought iron share similarities.Aluminum does not have nearly the same reputation as wrought iron gates when it comes to durability, as aluminum is much lighter, but this is a definite plus, should you decide to forgo an automatic gate entry system.The disadvantage to this weight discrepancy is that aluminum does not withstand impact as well as wrought iron. Whether you have safety concerns, or just simply enjoy having all the bells and whistles, you will find a plethora of additional gate features available for your convenience and sense of comfort for your family. Automatic Gate Opener- If you find yourself tired after a long day at work, the last thing you want when you arrive home is to first exit your vehicle to open your gate by hand, especially in unpleasant weather. An automatic gate opener will eliminate this need forever. Card Entry System- Popular among businesses and apartment complexes, card-based entry systems are the perfect solution to gates that deal with large amounts of traffic. The advantage of a card entry system in these situations is the ease of issuing cards only to those who have authorized access.In addition, a card system offers the simplicity of disabling a card to someone who is no longer granted access to the property, whereas a keypad system would require constant updating of the PIN code and making sure everyone is informed of the changes. Photo Eyes- Favored by parents, photo eyes are an invaluable security measure for families, because they not only help your gate protect your property, but they protect the well-being of children and pets as well.By using infrared technology, these sensors detect debris, pets and people who break the loop of the sensor beam when in the gate’s path. This triggers the gate to either stop completely, or reverse its direction. Depending on the volume of additional gate features, the type of material you desire, and gate style you choose, cost can vary greatly. For instance, an aluminum manual slide gate will be one of the most affordable options, while an automatic wrought iron swing gate will be on the opposite end of the pricing spectrum. Should you choose to go with a high-end option such as a wrought iron gate, you can potentially see an increase of up to five percent on your property value. With so many new gate styles and types available, it is always best to consult a professional who will be able to sit down with you and explore your options in specific detail.